To convert text to a table or a table to text, start by clicking the Show/Hide paragraph mark on the Home tab so you can see how text is separated in your document. Insert separator characters—such as commas or tabs—to indicate where to divide the text into table columns. Note: If you have commas in your text, use tabs for your separator characters. Use paragraph marks to indicate where you want to begin a new table row. Select the text that you want to convert, and then click Insert > Table > Convert Text to Table. In the Convert Text to Table box, choose the options you want. 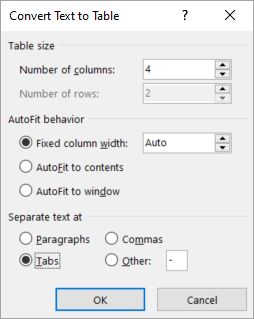 Under Table size, make sure the numbers match the numbers of columns and rows you want. In the Fixed column width box, type or select a value. Under Separate text at, choose the separator character you used in the text. Select the rows or table you want to convert to text. 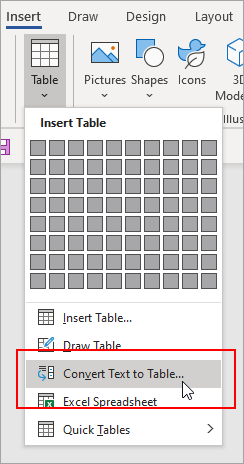 Under Table Tools, on the Layout tab, click Convert to Text. In the Convert to Text box, under Separate text with, click the separator character you want to use in place of the column boundaries. Rows will be separated by paragraph marks.